Cleanser: For all skin types. Sulfate and paraben free, contains Azelaic acid, willow bark, botanical apple, lemon and sugarcane and free of radical fighting antioxidants, green tea and vitamin E.
Mositurizer: Contains an exclusive blend of natural extracts and oils, including aloe vera leaf juice and sqalane, to hydrate and nourish dry, mature skin. Vitamin C: Corrective treatment for all skin types; provides anti-aging benefits and protection from photoaging. Stable form of Vitamin C, stimulates collagen production for a visable toning and firming effect. Hydroquinone RX: Promotes correction of uneven skin tone, lightens age spots, freckles and scars. Hydroquinone 4%, Kojic acid, Azelaic acide, Arbutin, Licorice extract and Retinyl palitate combine to exfoliate, bleach and inhibit hyperpigmentation, including melasma. Requires Rx. Hydroquinone Free: Skin brightener that contains Retinol, Kojic acid, Azelaic acid, Arbutin and Licorice extract. Exfoliates and refines the skin, improves skin clarity, re-texturizes skin, inhitbit hyperpigmentation including melasma, and helps reduce fine lines and wrinkles. In 1736 a great discovery was made in France, in the small town of Avène. It is here where the soothing and anti-irritating properties of Avène Thermal Water were discovered. A beautiful balance between water and skin, the Avène skin care line is ideal for the most sensitive and acne-prone skin. Adds hydration without adding oil to the skin. AKERAT: Urea, Salicilic acid, and Lactic acid. Relieves disconfort of rough, thick, flaky skin. Indications: Psoriasis, very dry, rough, scaly skin. Fragrance-free, paraben-free. Trixera: Relieves itching, restores the skin’s barrier, prevents mositure loss and soothes irritation. Fragrance-free, paraben-free. Suitable for infants, children, and adults. Available in emollient cream and balm in various sizes; cleansing gel and bath cleanser also available. Thermal Spring Water: Soothes, softens, calms and cools the skin. Minimizes skin sensitivity. pH 7.54 does not sting or burn the skin. Restores and maintains healthly skin balance. Indicated for all skin types; allergic, hypersensitive skin; inflamed, itchy skin; severely dry skin; rough flaky skin. Used in almost all of our post procedure care. Antirougeurs Calming Mask: Ulta-soothing repair mask provides immediate comfort by cooling, calming and restoring the skin; repairs irritated or weakened skin; skin feels refreshed; paraben-free, fragrance-free. Used in many of our post BBL care. Cold Cream Body Lotion: Rich and mositurizing cold cream products combine the emollient properties of almond oil and pure white beeswax with soothing Avene Thermal Spring Water to nourish and mositurize dry skin. Ultra-rich yet non-greasy formula hydrates and seals in mositure; extremely emollient, smooth texture penetrates quickly; helps restore dry, flaky skin. Cold Cream Hand Cream: Instantly soothes and mositurizes dry, chapped hands; non-greasy formula. Cicalfate Restorative Skin Cream: Indicated for scratches, cuts, scrapes, burns, cracked skin, stiches, hair removal, peri-oral dermatitis, post-procedure, post laser. Help speed the skin recovery process; promotes and maintains a healthy skin enviornment for optimal recovery; prevents signs of scarring; calms and soothes inflammation and irritation; suitable for babies and children, fragrance-free, paraben-free. Tolerance Extreme Cream: Indicated for hypersensitive skin, allergic skin, postprocedure (lasers, peels). Mositurizes, hydrates, and nourishes; restores skin barrier; helps decrease skin reactivity; formualted with only 9 ingredients. Mositurizing Self-Tanning Lotion: Non greasy lotion with pleasant fragrance; natural looking tan without damaging effects of the sun; healthy glow in just one hour. Men Shaving Foam or Gel: Contains 0.2% Triclosan (purifies); Hydrating Agents (prevents skin tightness caused by shaving). Helps reduce the risks of micro-cuts; creates a protective film for smooth shaving; hydrates and mositurizes the skin. Shaving foam is for normal beards and normal skin. Shaving gel is for all beard types especially course beards and blemish prone skin. Men After-Shave Balm or Fluid: Contains Triclosan 0.2% (purifies); Sucralfate 0.2% helps restore, hydrating agents prevents skin tightness caused by shaving; alph-bisabolo + Avene Theraml Spring Water 55%, soothes, soften and calms the skin. Helps restore the skin altered by the blade, mositurizes and protects the skin; calms and soothes razor burns. Paraben-free. Dermo-K ~ Care/Prevention of Ingrown hair: Contains Glycolic acid 3% (exfoliates); Urea 5% (moisturizes); Cu 0.2%-Zn 0.1% (purifies); Avene Thermal Spring Water 55% (soothes, softens and calms). Its exfoliating action releases ingrown hair; helps reduce irritation and redness due to inflammation; facilitates next-day shaving. Fragrance-free, paraben-free. Join Associated Dermatology's Preferred Patient program to purchase your favorite regimens! Glytone helps win the battle against aging with glycolic acid formulations to exfoliate, rejuvenate, and ultimately brighten the complexion for a more youthful appearance. Glytone offers the highest level of free glycolic acid for thorough skin rejuvenation and skin health. 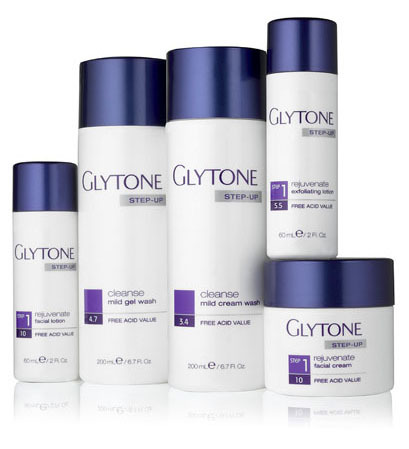 Whether your concern is hyperpigmentation or simple maintenance, Glytone has the perfect product for you. This skin care line containing glycolic acid, salicylic acid, and benzoyl peroxide was developed to fight and control mild to moderate acne. Together, these ingredients exfoliate, unclog pores, control blemishes, and inhibit the proliferation of acne. Heel and Elbow Cream: Cream with Free Glycolic acid that retexturizes, softens and smoothes dry, rough elbows and heels. KP Kit: Kit includes exfoliating body wash with high levels of Free Glycolic acid that exfoliates rough, dry skin helping to minimize red bumps and reveal softer, smoother looking skin, and Body Lotion, which helps soften dry skin while helping to loosen and remove dead skin cells. Clarifying Cream and Gel: Nighttime formulas using 4% hydriquinone to help lighten and reduce dark spots and other signs of hyperpigmented skin. The Cream formula is for normal to dry skin the Gel formula is for normal to oily skin. 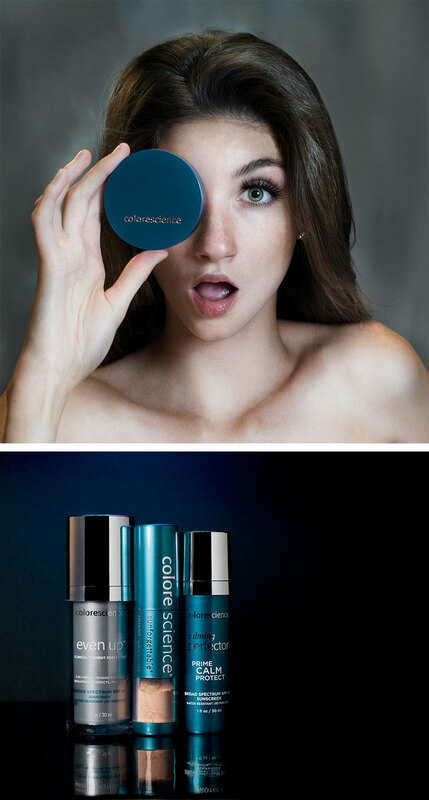 The intent of the Colorescience line is targeted more towards the sunscreen aspect of the product and general health of the skin, not the cosmetic aspect. Compliance in reapplication of sunscreen every two hours when exposed to sun is recommended for everyone, but is especially critical for patients going through any of our treatments. We have found that this particular line in the easiest to comply with and contains the highest quality of sunscreen. Many people don’t want to put another layer of cream based sunscreen on every two hours and have to redo their makeup; for these people, this product is a great option. The foundation brushes are our most sold item and come in SPF 30 and SPF 50. Another popular item is the mousse-like foundation called Sunforgettable Primer SPF 30. Colorescience® antioxidant and vitamin infused, broad spectrum SPF 20 & 30 foundations come in three finishes; liquid, loose or pressed with a shade selection that provides sheer to full coverage for porcelain to deep skin tones. Nouriche: Enhances the look of your lashes so they appear lush and luxurious; saturated with powerful conditioners; helps provide the appearance of stronger, shinier-looking lashes; ginkgo biloba helps protect lashes against environmental stresses; precision applicator. Hi-Def Tinted Brow Gel: A multi-tasking, breakthrough mineral tint styling gel that helps tame, enhance and condition unruly eyebrows. RevitaBrow® Advanced Award winning brow enhancing conditioner. Enhances natural eyebrows that may appear damaged from over styling or environmental effects. Different formulation and applicator specifically for the brows. Peptides and botanicals strengthen, condition, and nourish. RevitaLash® Advanced: Enhances lashes and protects against breakage while improving flexibility & shine for more dramatic lashes. Volumizing Mascara: Add volume & smudge-free drama to your lashes with this volumizing & defining mascara. Volumizing Primer: Silky matte formula with conditioning peptides prepares the surface of the lashes to maximize effects of mascara application. Volumizing primer goes on before mascara. Coats lashes to make them appear thicker and longer. Conditions the lashes so they become stronger and look softer. Additionally, coats the lashes to help prevent clumping, flaking and smudging of your mascara. Blue shade. 30+ Facial: Extra moisturizing for dry, mature skin. 7% zinc oxide. UV 30+ Body: For the body. 7% zinc oxide. 40: Normal or combination skin. 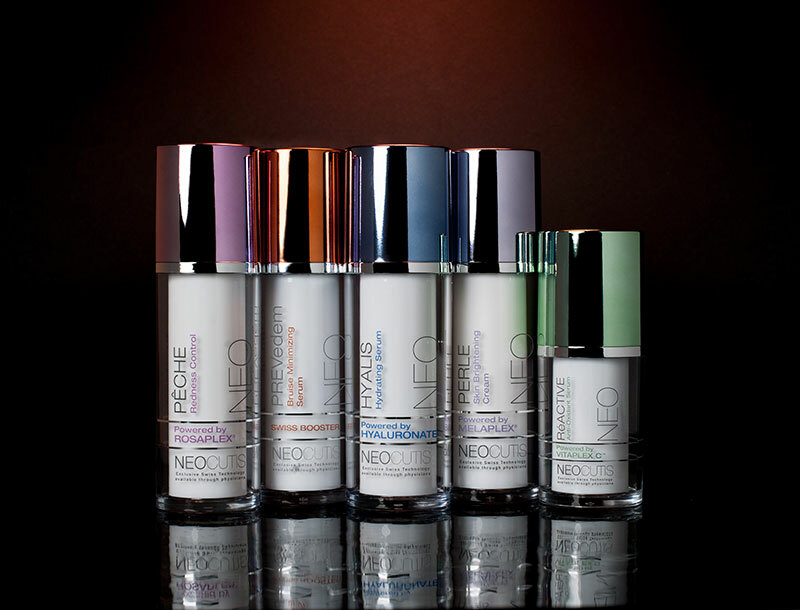 Light, sheer, contains hyaluronic acid to increase skin smoothness, softness and decrease fine lines. 9% zinc oxide. 41 Physical: Tinted, chemical free. 9% zinc oxide and 7% titanium dioxide. 45 UV Shield: For oily skin and all skin types. 9% zinc oxide. 45 Areo Continuous Spray: Water resisitant (80 minutes), sprays on white then dries clear. 9.3% zinc oxide. 46 UV Clear: For rosacea, acne prone skin and hyperpigmented skin. High-purity niacinamide, calms and protects sensitive skin and hyperpigmented skin. 9% zinc oxide. 47 Pure: For all skin types. Natural, chemical free. Very water resistant. Glides on wet or dry skin. Oil-free, sensitivity-free, fragrance-free, paraben-free, hormone-free, dye-free, gluten-free, noncomedogenic. 10% zinx oxide, 5,5% titanium dioxide. 50+ UV Sport: Very water resistant, for athletes, outdoor activities, children. Won’t rinse off in water/drip into eyes. Goes on wet or dry skin. 9% zinc oxide. Eye Gel: Oil-free formula helps eliminate undereye puffiness, dark circles, fine lines and wrinkles while generating brighter, healthier skin. Special peptides and natural extracts stimulate collagen synthesis and hyaluronic acid production within the dermis to rebuild the skin matrix and prevent the appearance of skin aging. Significant results are usually visiable within 30 days. AM Therapy Facial Moisturizer: Provides all-day moisturizing in a very lightweight base; improves skin texture and tone; stimulates cell turnover. As you head off to work, make sure your morning mositurizer is up to the job too! This lightweight, oil-free moisturizer provides all-day relief from dry skin. Use it daily to enhance skin color and improve skin tone. EltaMD AM Therapy is oil-free, fragrance-free, noncomedogenic and safe for sensitive skin. EltaMD AM Therapy Facial Moisturizer increases moisture absorption and retention by stimulating aquaporins in skin cells. Willow bark extract gently stimulates cell turnover for smoother skin without causing irritation. Niacinamide (vitamin B3) enhances skin color and tone. PM Therapy Facial Moisturizer: Strengthens skin’s mositure barrier, improves skin color and tone, repairs and restores elasticity and vitality, safe for all skin types. Ceramides strengthen the skin’s natural moisture barrier. Niacinamide and antioxidants improve skin color and tone and speed the metabolism to maximize the nightly skin repair process. Small rice protein peptides penetrate to stimulate cell growth and collagen formation, resulting in more skin elasticity. As it nurtures, revitalizes and oxygenates the skin, wrinkles fade and skin tone improves, resulting in smoother, fresher appearance. Foaming Facial Cleanser: EltaMD Foaming Facial Cleanser is an innovative formula with a bromelain and apple amino acid blend. Its self foaming action gently yet throughly removes make-up, oil and other impurities. When applied to moist skin, EltaMD Foaming Facial Cleanser quickly generates thick foam that lifts and suspends impurities. The foam rinses off cleanly, leaving the skin feeling smooth and silky. Because no harsh surfactants or vigorous rubbing are involved, the skin retains its natural mositure barrier. It is gentle enough for use by the entire family morning and night. Moisturizing Body Lotion: Therapeutic lotion developed for daily use; soothes dry itchy skin leaving it feeling silky-soft. Apply immediately after bathing for all day mositurizing. Strengthens the skin against damage from frequent hand washing, swimming and cold, dry air, sensitivity-free, perservative-free. Intense Moisturizer: Put your skin problems to bed with this unique moisturizing creme formulated for nighttime use. It melts quickly, spreads easily and absorbs deeply. Apply it to soothe red, irritated and flaky skin caused by environmental issues or medications such as tretinoin. EltaMD Moisturizer also works well on minor to severe burns, including sunburn. It may also be used to help relieve symptoms of eczema or atopic dermatitis. Melts on contact and retains 90% of skin’s mositure for at least 12 hours. Soothes irritation, redness and flaking. Helps relieve skin problems associated with diabetes, renal disease and medications. 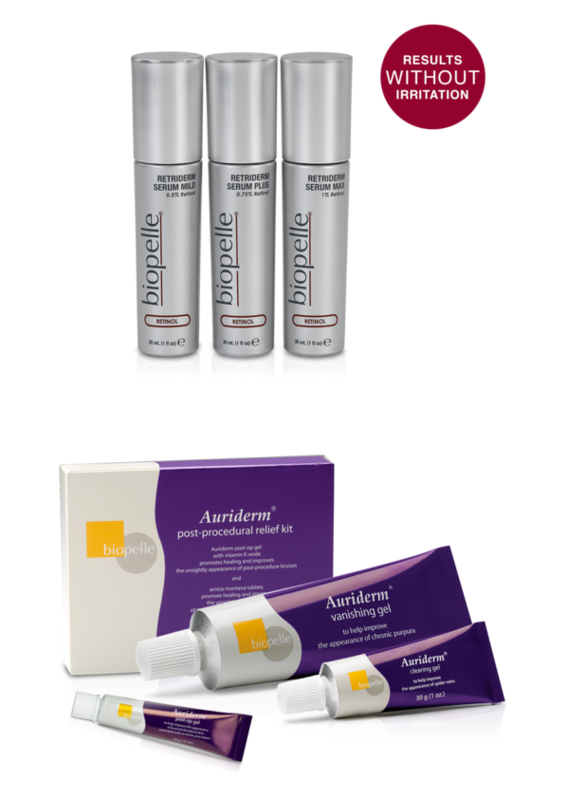 Associated Dermatology Advanced Laser Clinic caries a complete line of Biopelle products. Biopelle PRESCRIBEDsolutions offers a customized skincare product for each individual patient. Our highly trained nurses create a perfect regimen that work’s with your skin’s natural circadian rhythm. Auriderm® Clearing Gel helps to improve the appearance of spider veins. Spider veins are small, thread-like veins most often seen on the surface of the skin. They are formed when a tiny pinhole tear occurs in the capillary or artery beneath the skin’s surface. Auriderm® Post-Op Gel helps to promote healing and helps improve the appearance of post-procedure bruises. Bruising and swelling are common side effects of many aesthetic procedures. Auriderm® Post-Op Gel helps to significantly reduce the severity and duration of a bruise by about 50%. This gel is perfect for use after procedures including injectables, dermal fillers, and vascular treatments. Auriderm® Post-Procedural Relief contains the Auriderm® Post-Op Gel (which helps the body’s natural healing process) and a 5-day supply of sublingual Arnica Montana tablets. Arnica Montana has a long homeopathic history for reducing swelling, which frequently results from procedural trauma. Biopelle® Exfoliating Heel Cream 30% Glycolic Acid is ideal for calloused and cracked feet. This exfoliating cream contains Glycolic Acid + Taurine for intense results. It removes dull, dead skin cells and leaves feet looking smooth and feeling soft with additional moisturizers to help provide long-lasting hydration. Enhance Weekly Mask is a breakthrough innovation that combines Binterin (CD99) peptides in an anti-inflammatory cooling fluid to promote your fast, effective recovery from micro-invasive procedures, microneedling and peels. Enhance can be used as an accelerator to a regular skincare regime and is core to The Vivace Experience™. Gently unfold the mask and place it directly on the face, making small adjustments for eyes, nose and mouth. Recline and relax for ten to 20 minutes. Massage remaining product into neck and hands when mask is removed. Soothe Recovery Spray is spritzed on your face immediately following your Vivace Experience for immediate cooling and soothing effects. This high-quality spray contains ingredients essential for cellular rebirth of your treated skin. It’s all natural and accelerates tissue repair. Soothe Recovery Spray provides the missing essential elements needed for your skin’s health, beauty and protection against dryness and aging, making it perfect for your regular skincare regimen as well. Use immediately following your treatment and as part of your home-care as needed and as long as desired. Soothe Recovery Balm has a low melting rate with a paraffin base that provides protection to the microchannels in your skin immediately post treatment. It is soothing and reduces tightness that might follow treatment. It’s easy to cleanse, making it comfortable to use after treatment and as a moisturizer for dry scaly skin. 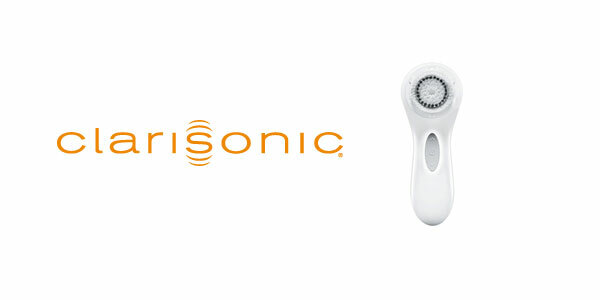 The Clarisonic® brush has a soft, gentle brush that moves back and forth at more than 300 times per second. The sonic massaging cleans your pores while loosening dirt, makeup, and oil. Clarisonic® is proven to remove more dirt (sebum and makeup) than your fingertips or other superficial cleansing, allowing your serums and moisturizers to absorb better. The result is skin that's clean, clear and radiant. Discover the beauty of healthy skin with the Clarisonic® micro-massage brush. Effectively cleans without abrasion, sweeping away impurities to unclog pores. Healthier, softer, younger-looking skin is revealed. Gentle enough to use twice a day. The Clarisonic Skin Cleansing System uses a patented sonic frequency of more than 300 movements per second to clean, soften and smooth skin. In just 60 seconds, the micro-massage action removes 6X more makeup and 2X more dirt and oil than cleansing with your hands alone! Developed by Dr. Dan Viders, Dr. Dan's CortiBalm™ is a hypoallergenic medicated lip balm that contains 1% hydrocortisone, making it a perfect lip moisturizer for patients who experience severely chapped lips due to sun, wind or cold weather exposure. 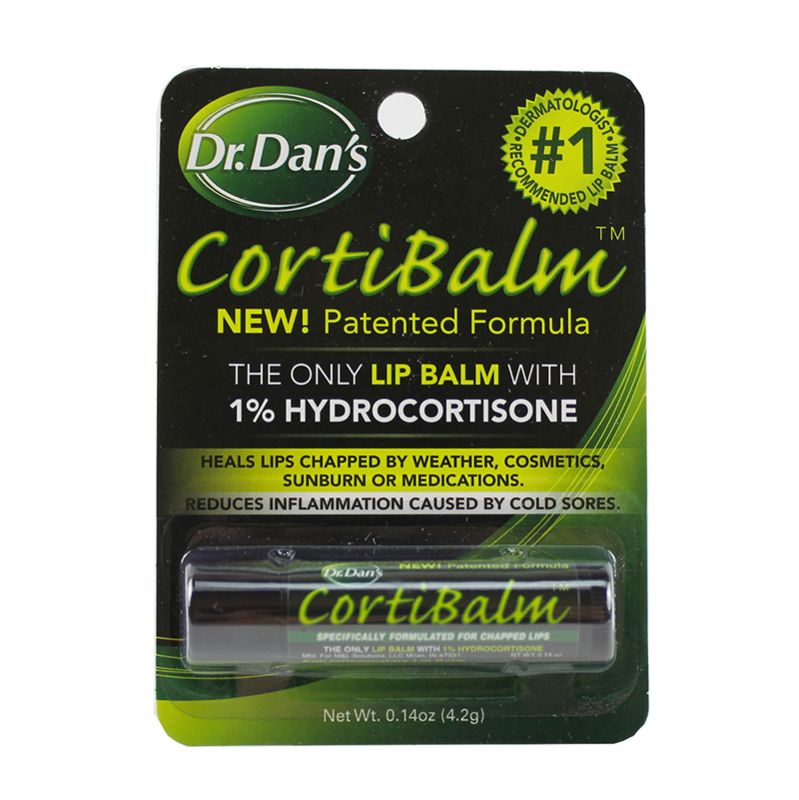 FACT: Dr. Dan’s Cortibalm is the only medicated lip balm with 1% hydrocortisone for ALL types of chapped lips. 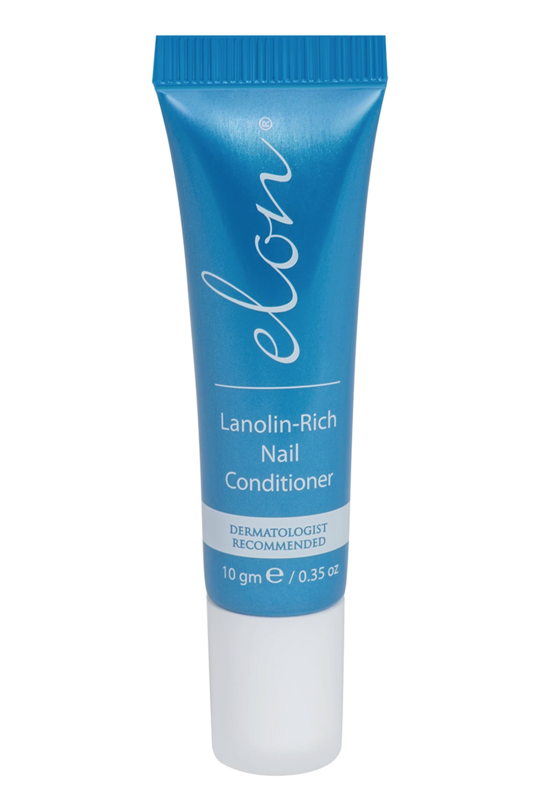 ELON Lanolin-Rich Nail Conditioner is dermatologist-recommended and transforms nails with a gentle, conditioning formula infused with oxyquinoline to strengthen and thicken cuticle fibers. It helps with a variety of nail problems such as cracking, splitting, peeling, thin, brittle or difficult to grow nails. Emollient lanolin assists in the natural and smooth regrowth of nails. Epionce is a physician strength skin care line created by a clinical dermatologist, Dr. Carl Thornfeldt. Epionce is rooted in the hard science and integrates over 20 years of clinical skin research. Epionce provides the foundation to address your unique skin care needs. From improving the visible appearance of skin aging to problem skin, Epionce has a regimen to solve your specific skin concerns.